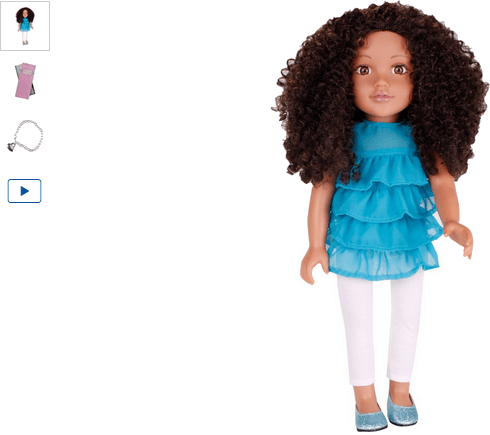 Your new Chad Valley DesignaFriend Ava Doll has gorgeous curly brown hair and large brown eyes. She comes wearing a pretty layered turquoise T-Shirt with jersey leggings and sparkly glitter shoes, and also includes charm bracelet with heart pendant and a miniature fashion diary so Ava can make notes on all the very latest fashion trends. Get money off with April 2019 free Argos voucher codes, see if there's a promo code for the Chad Valley DesignaFriend Ava Doll product. Argos may be out of stock of this product. To enhance your shopping experience you may also be redirected to a search results page when you click an outbound link. 5.0/5 from 6 recent reviews.